1) Since you served in 601, that makes you a millionaire, correct? A million isn’t what it was then. (Snark encouraged in your answer. I have been waiting a long time to make that joke). What did you do in 601 and when did you serve? First National Service pilot to join 601 having served 18 months compulsory (but most welcome) service in the RAF undergoing pilot training (elementary on Prentices; Advanced on Harvards/Texans) plus three months jet conversion on Meteors. Joined 601 in 1950; squadron disbanded in 1957. Nestle sent me to America in 1959. 2) Why, at this stage in your life, did you decide to write another book? 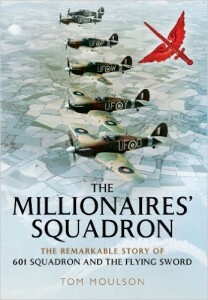 Your previous book, “The Flying Sword-The Story of 601 Squadron” was published in 1964? That’s a 50 year span! I had no intention of doing so, but a group of American enthusiasts who had cultivated an interest in 601 and had a website for that contacted me for information and then pressed me to re-publish The Flying Sword, which in the process of updating morphed into a new one in content, length, and style. Below is their website. Also mine. 3) In your own words, please describe your book? Fantastic! OK, I’m sending you below a review from America which I found pleasant and descriptive. Tom sent me a review by Lt. Col. Joseph Romito (USAF) that is available on the web. 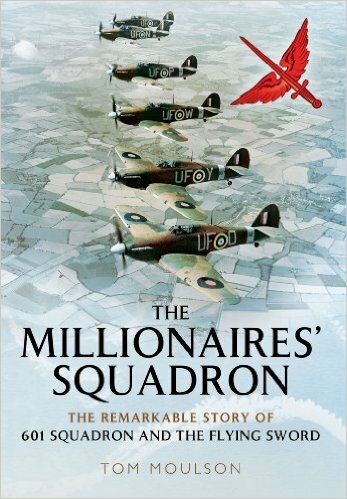 4) How is “The Millionaires’ Squadron” different from “The Story of 601″ ? 1) Sixty percent longer because it doesn’t stop in 1957 but follows the triumphs and tragedies of members and their families right up to 2014. 2) More detailed thanks to the internet and email, as opposed to typed snail mail and shoe leather. 3) Much more on Malta, Africa, and Italy; more insight into air strategy and Keith Park; 4) Wider focus and human stories spanning time: the disinterment of Michael Doulton with his widow and son Paul present; Billy Clyde and Acapulco; the execution of Bushell’s executioner; Ray Sherk in Hamburg with the man he shot down in Africa; cataract surgery, etc. 5) In 2015, is there any military or flying unit–IN THE WORLD– comparable to 601 Squadron as it existed in 1940? Depends on what about them you compare. There were other Auxiliary squadrons of course. Can you imagine New York hedge fund managers or London investment bankers joining the RAF today? Probably not the regular RAF because it wouldn’t pay enough. But as front-line auxiliaries I certainly can; they are just the types. I visited an Air National Guard squadron in Michigan composed of airline pilots and professionals, with the same mischievous behavior. 6) I agree with your thesis that 601 knew war was coming in the mid to late 1930s. These men–Roger Bushell, Max Aitken, Billy Clyde, etc– were all skiers used to spending time in the Austria and Switzerland. They saw the rise of Nazi Germany from a ski lift. Was anyone in the British Government listening to them? They didn’t have to listen to them: they knew. A huge expansion of the RAF was begun and single seat, 8–gun monoplane fighters were ordered – Spitfires and Hurricanes. Churchill had detailed and recent in formation but everyone knew, It would take time and the government played for time. That was the reason for Munich. for which Chamberlain got a bad rap. Still, he wasn’t the man to lead the country into a war it dreaded. It can’t be stressed too much that only Churchill could have done that. 7) Why are we attracted to Roger Bushell? I wrote a book on him. You devote 2 chapters to him (Chap. 11 “The Murder of Roger Bushell, The Flying Sword” ; Chap 11 “The Fate and Fame of Roger Bushell, The Millionaires’ Squadron”). I don’t believe his name would be known today if it weren’t for The Great Escape. 8) Who was Whitney Straight? That young men had an incredible war record as well. What did he do in World War 2? Chapter 7 contains everything I know. 9) How has your writing changed over the years? Are you a better writer now than you were in 1964? Was this book easier or harder to write than “The Flying Sword” ? I’m a better writer, thanks to maturity. The later book was much easier because of all the help I got from people I never met, all over the globe. I didn’t have a better copy reader though. I mean, you obviously care a great deal about the 601 legacy. I just thought you had that license, as a former flyer in 601, to inject more of that voice in the book. Please explain. I made a conscious effort to exclude myself from the content except for the bookends. I feel humble when writing about most of these people, but I also think that being apart gave a sense of objectivity. It certainly freed me to criticize and ridicule in places. Favorite paragraph. This one epitomizes the Auxiliary attitude in the early days. Nepotism and favouritism were perfectly natural, as was the assumption that only an officer could fly an aeroplane and only a gentleman could be an officer. Grosvenor cannot be dismissed as a grandiose commander or a pleasure-seeking flyer. He realised that air fighting meant killing and, perhaps, being killed. As with all Territorials, patriotism placed at least second to esprit de corps as a motivation, and a commitment to fight for one’s country was total. During the First World War pilots carried with them a revolver, as much as anything with which to shoot themselves if plunging to earth in a bonfire of wood and fabric and dope, but also as a means of attack. Exasperated by the ineffectiveness of this, Grosvenor carried a loaded, sawn-off shotgun in his cockpit; no ordinary shotgun of course, but a bespoke model made to his specifications by J. Purdey and Sons and designed for shooting at flocks of birds. Although the navy and army looked down on the regular RAF, the latter never suffered from lack of self-esteem. Far from it. They knew that pilots were the cream of the military because only they could fly. Anyone can stand on a ship’s deck or hold a rifle, they knew, and no doubt some sailors and soldiers could also fly if given the chance, but they couldn’t. Only pilots could fly, and there was no changing that. They could look down on the other services, literally from above. The Auxiliaries would adopt this self-regard and inflate it. Being from the cream of society they considered themselves double cream, as it were, and they were not bashful. Inverted flight was a favourite act of Shrosbree’s. By trimming well forward he could so easily hold the angle and altitude while on his back that he could probably have flown cross-country like that. He returned to North Weald and then home for another drab week at the Stationery Office, blithely unaware that he had just lit the touchpaper of an enormous rocket that would soon be heading his way. It wasn’t just that he had overflown the adjacent Twickenham sports arena ‘at which the RAF had been playing the army at rugby, and lost’, as he says, but that among the audience were most of the Air Council, including [Marshal of the Royal Air Force, the top dog] Sir John Slessor’. Just as Slessor was about to enter his car he turned towards the sound of an approaching aircraft and saw a Meteor streaking across the field at full at throttle and low level, inverted. Horrified and embarrassed he shouted to an equerry, ‘GET THAT MAN!’ bumping his head on the car’s door frame at the same time. The rocket took off. UNCLAS AO 167. LOW FLYING AIRCRAFT COMPLAINT. AN AIRCRAFT REPORTED OVER TWICKENHAM AT 1640Z ON 27 MARCH HAS BEEN IDENTIFIED AS A METEOR MARK EIGHT. STATIONS ARE TO MAKE INVESTIGATIONS AND REPORT IMMEDIATELY BY SIGNAL. NIL RETURNS ARE REQUIRED. On the afternoon of the 27th of March, 1954, I was briefed for an aerobatic sortie on the local flying area, and set out from North Weald on a south westerly course. When I had estimated that I was clear of the London Control Zone, I descended in order to determine my position, as the visibility was very poor. I pinpointed myself at Kingston in error, and commenced to climb again, executing a roll at the same time. I didn’t realise that I had been near Twickenham until recent enquiries were made and I apologise for violating Air Traffic Regulations in this manner. Shrosbree’s tortured explanation that after having inaccurately pinpointed his position in very poor visibility he just happened to perform a roll while climbing away must have prompted some snickers among the staff at Fighter Command HQ. The CAS didn’t buy it. Shrosbree was summoned before AVM H. L. (‘Sam’) Patch, newly appointed AOC and, in Shrosbree’s words, ‘was marched into Patch’s office by a group captain. “Left, right, left, right. Cap off.”’ After ‘the most uncomfortable five minutes of my life and a right bollocking,’ Shrosbree added, Patch said, ‘My punishment is that you be severely reprimanded. Do you accept this?’ ‘Yes sir,’ Shrosbree replied. Sam Patch then said ‘dismissed’. As Shrosbree was marched out, shaken by the tongue-lashing (left, right, left, right, etc.) Patch bellowed, ‘Right, I’ll see Shrosbree now.’ The group captain grinned and handed Shrosbree his cap just as Patch called out, ‘Sybil … bring us some tea. Please sit down old chap’. 12) Tom. Thank you very much for this. You wrote a very important book about one of the most unique flying units in history. I enjoyed it very much.